Part of the hotel is housed in the OÂ’Rourke Building, a warehouse that was originally built in 1916 by the Crandall Transfer and Warehouse Company. Element Hotels, part of Marriott International, and Ctwo Hotels, announces today the opening of Element Moline, marking the debut of the brand in Illinois. With the support and inspiration of the Moline Historic Society, Element Moline offers guests eco-friendly and wellness-focused amenities within the historical surroundings of one of Moline's oldest buildings. Part of the hotel is housed in the O'Rourke Building, a warehouse that was originally built in 1916 by the Crandall Transfer and Warehouse Company. "We are thrilled to be bringing Element Hotels to Illinois for the first time with the opening of this landmark property," said Marlon Whyte, Senior Global Brand Director of Element Hotels. "The O'Rourke Building is an important part of the history of Moline, and we're excited to be part of the city's future." Located near the Mississippi River, the six-story building features earth tones and nature-inspired designs throughout while retaining the same structure and foundations of the historic building. The design includes many details of the original warehouse such as exposed brick and columns in its spacious guest rooms, and many components of the building's lobby, ceilings, and flooring have been preserved. The hotel also features a firepit in the interior courtyard. The project embraces Element Hotels' sustainable design philosophy—the National Park Service partnered with the ownership to review and approve every aspect of the project, including the restored Art Deco façade and entrance. "One of the great things about this adaptive-reuse project is how it has created such a unique property out of a historic landmark building in the city of Moline," said Mike Amin, Owner/Managing Partner of The Amin Group. "It has been an exciting project preserving the historic charm of this building while turning it into a stylish and modern destination for the neighborhood and visitors." Element Moline offers guests the many eco-friendly amenities that are an important part of the Element Hotels experience. It features decor and artwork from repurposed and recycled materials, low VOC paint, and every light bulb in the building is LED. All 96 spacious guest rooms provide travelers with a filtered water system within each room. In the bathroom, guests will find low-flow faucets, toilets and showers, as well as environmentally-conscious body lotion, shampoo, conditioner and soap, containing certified organic ingredients by Pharmacopia, an all-natural vegan and cruelty-free brand. Guests can ensure they never miss a beat while traveling by using the hotel's 960 square feet of meeting space, which includes two meeting rooms for conferences and gatherings – one of which is named after the original owners of the building, Crandall. The hotel also includes complimentary high-speed internet access throughout all guestrooms and public spaces, as well as access to a print and fax machine. Designed for the longer-stay guest, Element Hotels allow guests to maintain a healthy and active lifestyle while on the road. To cater to this, the hotel offers a complimentary Rise breakfast every morning featuring a yogurt station, a fresh range of whole fruits, and more. The hotel is equipped with an indoor saline lap pool and an 830-square-foot Motion Fitness center, open 24/7. To keep track of their workout, guests can monitor themselves with the Your Trainer app, which is a virtual training app that customizes workouts to your goals, fitness level, and schedule. The app has workouts fine-tuned for the equipment at Element Hotels. The property also benefits from Element's Bikes to Borrow program, which is run in partnership with Priority Bicycles. For those looking to unwind after a long day, the hotel also offers Element's signature 'Relax' reception hour, where guests can enjoy complimentary organic beer, wine, soft drinks and appetizers. 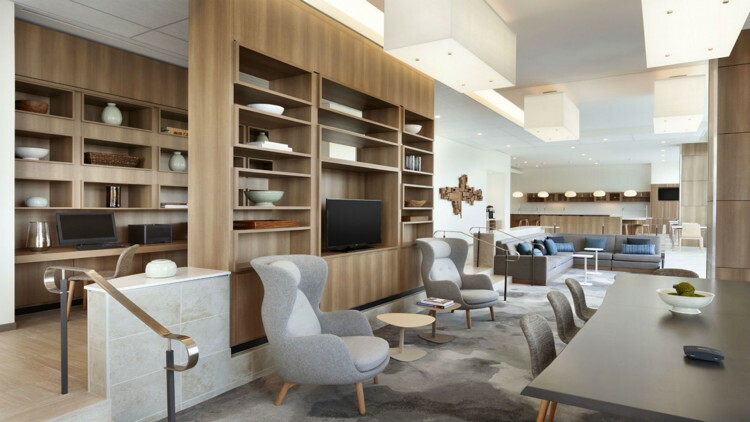 "Element Hotels empower guests to stay in their element while they are traveling for work or for leisure," added Whyte. "At Element Moline, guests will be able experience wellness on their own terms – whether that is keeping up their fitness regime at our Motion fitness center, enjoying a healthy breakfast or relaxing with a glass of wine in the evening." Element Moline marks the hotel component of The Q, a multimodal development designed by Legat Architects that includes a train station with service to Chicago. The hotel renovation includes 16,000 square feet of retail/restaurant space, along with a new glass pavilion that serves as the rail station's Grand Hall on the east side. The Grand Hall rail station will serve as a new Amtrak stop for the Quad Cities that is currently under construction. Are you with Element Hotels? If you are a member of Element Hotels you may be interested in learning how to optimize your content on our network.